A man has been locked up for six months after being found guilty of taking part in the “barbaric sport” of badger baiting. 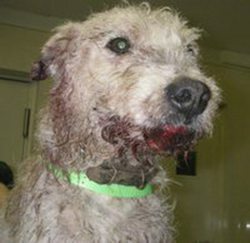 John William Lee was arrested as he walked through a busy town centre while blood dripped from the face of one of his dogs. The 40-year-old was also carrying a rucksack on his back with a garden spade sticking out of the top. When his bag was searched, an eight-inch machete was found. At his trial at Teesside Magistrates’ Court yesterday, John William Lee, of Farndale Avenue, Middlesbrough, denied one charge of wilfully attempting to take a badger and two charges of causing unnecessary suffering to his two dogs. But the court was told that one of his dogs was in such a terrible condition that a member of the public flagged down a police officer. Lee was arrested in the middle of the afternoon on January 26 last year as he made his way through Yarm town centre. Matthew Brash, television vet and badger expert, told the court the wounds on the Plummer terrier were the type associated with badger bites. But Lee’s solicitor Nic Woodhouse said: “There was no evidence that any badger had been injured by his dogs and there was no evidence that any badger had been found dead. Magistrates found Lee guilty and sentenced him to six months for wilfully attempting to take a badger. He was also sentenced to two months concurrent for causing unnecessary suffering to his dogs and for allowing them to come in contact with wild animals. The court heard the cost of bringing the case and kennel fees was in excess of £10,000, but due to Lee’s lack of income no court costs were imposed. Both dogs are still in the care of the RSPCA. Speaking after the hearing, RSPCA Inspector Mark Gent said: “This sentence sends out a strong message to the people that are intent on taking part in this so-called sport. “Badger baiting is still a problem and the RSPCA will respond to any information that we are given from members of the public.